When he came to power in 1970, Sultan Qaboos bin Said of Oman began efforts aimed at modernization and reversing isolationism. Having graduated from an English military academy and served in a Scottish regiment, he had developed a taste for Western military band and Scottish bagpipe music. During the 1970s and 1980s several military wind bands and bagpipe bands were founded at his command, with only Omani musicians allowed. The pressure to perform well was intense, and a high standard of musicianship was attained in a fairly short time. Increasingly, efforts are being made to include Arabic music in the repertoire; bagpipes are considered particularly suitable, as their intervals match some Arabic scales better than those of wind band instruments. 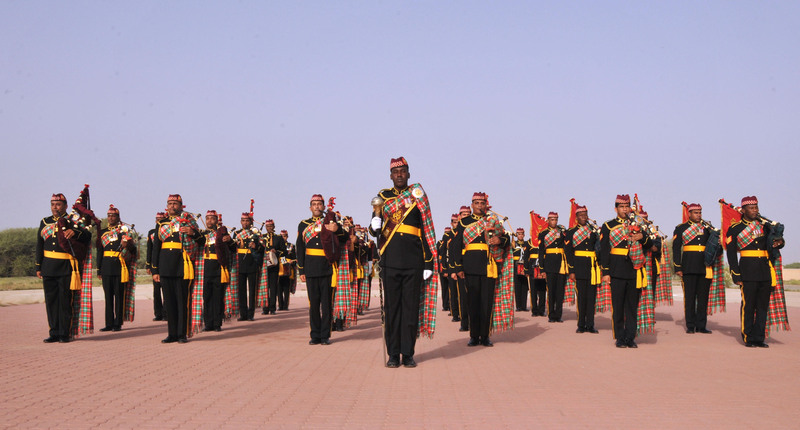 Above and below, the Royal Army of Oman‘s pipe and drum band. Sorry, we have no idea. Best wishes anyway!